Skin care is a major thing for my morning and night routine. 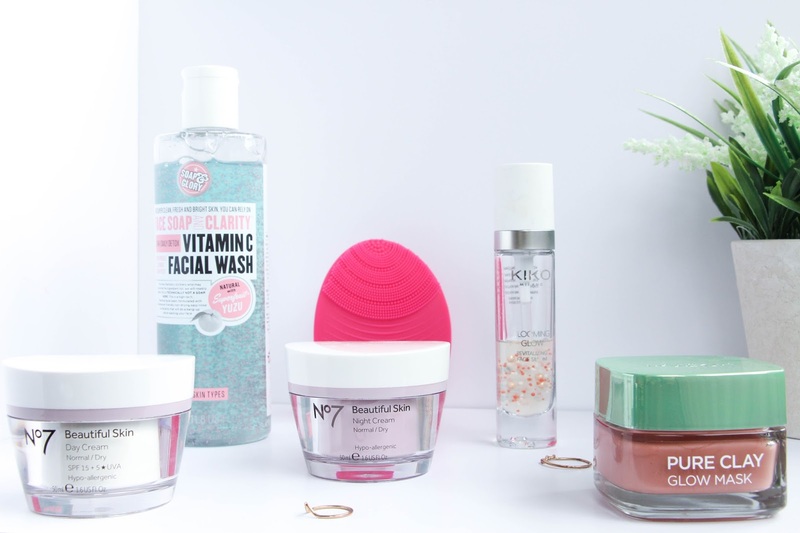 I have been trying to stick to products that really work for me and I finally have my skin care routine that I follow religiously – or at least I try to! There are a couple of products I quite recently added to my routine that I really wanted to share with you. I have noticed so many good changes on my skin that I had to write about this topic and today is the day! Let’s start. First I start by washing my face using the Soap and Glory Face Soap and Clarity 3-in-1 Daily Detox Vitamin C Facial Wash. This face wash has sort of a minty scent that I adore and it really makes my skin feel refreshed. I tend to reach for my Sonic Massaging Facial Cleaner that I got on TK Maxx for £12,99 to wash my face. It is not a Foreo or whatsoever but it really does the job and I can’t tell you how surprised I am by the effects it has on my skin. First, it does wash my face quite perfectly and I feel like it tightens my pores. After using it several times, I notice that my skin looks much healthier and my pores are much less noticeable. If, like me, you can’t afford the Foreo Luna, this is definitely a great opinion and much more purse-friendly! I can’t find the one I own but I guess there are many out there that actually do a pretty good job, it is just a matter of trying it out. After this, I apply the KIKO Milano Blooming Glow Revitalizing Face Serum. I have already reviewed this product on the blog here but long story short, this smells amazing, feels great on the skin, completely hydrates my skin and it definitely does wonders. I just realized that they discontinued this product and I am gutted!! How will I survive when I run out of this? Give me options! To finish with my quick but great skin care routine, I apply my moisturizer – either day or night cream depending on the time of course. 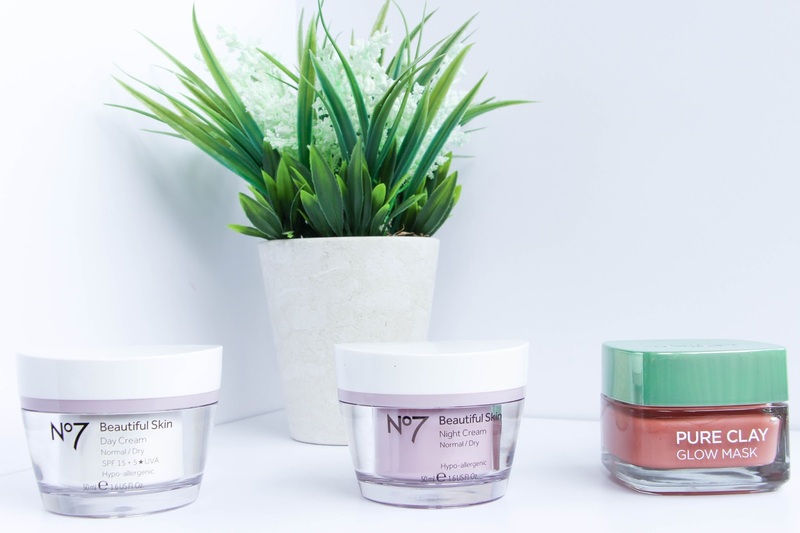 I have been loving the No7 Beautiful Skin range for normal to dry skin. I can honestly notice a massive difference after sticking to these products. If you have dry skin, this really, really helps! They both have quite a thick consistency that feels great on the skin and totally hydrates does annoying dry areas. I totally recommend these moisturizers. To finalize, twice or three times a week I use my L’oreal Paris Pure Clay Glow Mask – I am in love with this product and, again, I have reviewed it on the blog quite recently, here. This really brings my skin back to life. I have dry skin and it is also quite dull and lifeless and this face mask truly does wonders. I honestly advise you to try it out. Yesterday, I made two of my friends buy it and I know they will thank me later. This is as simple as it gets with my skin care routine. I still have to find a great hydrating eye cream but I am still looking for it – please leave me any recommendations on the comment section. Let me know if you have tried any of these products or if you think that there is something that I totally need to add to my regime! I love finding new products.